North Korea’s global network of state-run restaurants, most in China, are dens of espionage and sites of operations involving tens of thousands of overseas North Koreans who send the regime in Pyongyang more than $100 million in hard currency annually, according to U.S. and western intelligence officials. In Asia alone, the U.S. government has identified 60 restaurants ranging from Nepal to Cambodia to Dandong, China – located along the Yalu River separating China from North Korea. Additionally, North Korea has dispatched up to 40,000 guest workers abroad. The workers are forced to live in slave-like conditions and provide a large portion of their funds to the communist government, said officials who discussed intelligence on the operations on condition of anonymity. North Korea’s restaurants have become important sources of currency. The restaurants make annual payments to Pyongyang of between $10,000 and $30,000, according to defectors from North Korea with direct knowledge. From the 60 restaurants in Asia—including 44 in China, one each in Bangladesh, Burma, Malaysia, Nepal, Indonesia, and Laos, and five each in Cambodia and Vietnam—up to $1.8 million is remitted to Pyongyang. Under Kim Jong-Il, Kim Jong-Un’s predecessor and father, all North Korean foreign intelligence stations were directed to procure their own funds. "The Reconnaissance General Bureau has been using its North Korean restaurants in Beijing to finance its operations," one defector said. The North Koreans operate 11 restaurants in the Chinese capital; six in Shanghai and six in Dandong near North Korea. Many of the restaurants feature a traditional cold noodle dish and include song and dance numbers by North Korean waitresses and singers who intelligence officials say are also trained in the black arts of intelligence seduction. The restaurant network is controlled by the North Korean military’s General Reconnaissance Bureau—specifically, Bureau 39, which is in charge of gathering hard currency for the regime. The Bureau is part of North Korea’s vast political police and intelligence system designed to keep the totalitarian communist regime of ruler Kim Jong-Un in power. The General Reconnaissance Bureau is under Gen. O Kuk-Ryol, a National Defense Commission vice chairman, who has been directly linked by U.S. intelligence to North Korea’s production of counterfeit $100 bills so convincing they have been dubbed "supernotes." The Treasury Department recent issued a new $100 bill with security features designed in part as a result of the North Korean counterfeiting. The restaurants also have been linked to money laundering operations and other illicit activities by North Korea, whose agents in the past have been implicated in illegal drug trafficking. The Pyongyang Koryo Restaurant in Dandong was opened in 2012 and is the largest franchise with more than 200 staff workers. It is located in a five story building on the Yalu River separating China from North Korea. Another mission of the restaurants is to spy on South Korean travelers who frequent the restaurants. Defectors say waitresses at the eateries are trained in intelligence gathering with an emphasis on prying corporate secrets from business travelers. The restaurants are also meeting places for North Korean intelligence officers and North Korean agents. Officials, businessmen, and overseas workers also frequent the restaurants to recruit targets for foreign intelligence services, including the Central Intelligence Agency (CIA), China’s Ministry of State Security, and South Korea’s National Intelligence Service, as well as other spy agencies. Sheena Chestnut Greitens, a Harvard researcher who has studied North Korea’s efforts to gain hard currency overseas for the past 10 years, has visited several North Korean restaurants in Asia. The restaurants are part of a major expansion of overseas efforts focused mainly on dispatching workers who remit payments to Pyongyang, she said. "Since the mid-2000's, North Korea has significantly expanded its overseas labor presence worldwide, both in terms of the number of countries and the overall number of workers involved," Greitens said in an email. "Restaurants are a big part of the expansion, but by no means the only line of business that North Korean workers are employed in." In addition to restaurants, North Koreans are involved in logging timber in the Russian Far East and in construction and medical work in the Middle East and North Africa. North Korea also earns hard currency from teaching martial arts and building monumental statues of political leaders in Africa, including in Mali, Benin, Botswana, Zimbabwe, Namibia, and Senegal." According to Greitens, of Harvard’s Fairbank Center for Chinese Studies, several units of the North Korean government appear to be organizing the overseas funding as a way of bankrolling operations and contributing cash to the central government. "Interviews with people who have been sent overseas for this kind of work and later escaped to South Korea suggest that the workers make a couple hundred dollars a month, but that the regime takes between 50 percent and 80 percent of their earnings for expenses and ‘loyalty offerings’ to the party or the leaders," she said. A South Korean research group has estimated North Korea’s earnings from foreign workers and enterprises at between $150 million to $230 million, Greitens said, noting she considers the estimate high. For U.S. policymakers, the restaurants and foreign North Korean workers have made it more difficult to use financial pressure to rein in North Korea’s nuclear and missile programs and limit dangerous arms exports. The United Nations and successive U.S. administrations have squeezed North Korea since the 1990s in response to underground nuclear tests and long-range missile tests that are regarded as destabilizing to the region. Beginning in 2007, the U.S. government took the major step of sanctioning a bank in Macau, China that was a key source of currency for North Korea. The sanctions prohibited any U.S. financial institutions from dealing with the bank and intimidated other financial institutions around the world that might do business with North Korea. Former State Department official David Asher, an architect of U.S. financial policies toward North Korea, told the South Korean Yonhap News Agency last month that in order to pressure Pyongyang into changing its nuclear posture, "we are going to have to aim at the financial heart of Kim Jong-Un’s regime." Asher said North Korea continues to engage in illicit activities and arms proliferation to fund its system because "they literally don't have enough means to generate wealth internally to satisfy the need of the regime." The United Nations imposed sanctions on North Korea in March following a third underground nuclear test. The sanctions restrict banking, travel, and trade. It was the eighth time the world body has imposed sanctions on North Korea since 1993. The latest sanctions are making it more difficult for North Korea to earn cash from its exports of ballistic missiles to states such as Iran and Syria that in the past have been a major source of currency. One source of information about North Korean overseas restaurant operations was a manager who defected to South Korea. The defection in November 2010 of a manager at the Kumgangsan restaurant in Kathmandu, Nepal, forced Pyongyang to shut down the restaurant temporarily and return all staff to the country. The defector has been identified only as Yang and reached South Korea via India. "North Korean agents assigned overseas often use North Korean restaurants to forge their identities and to contact people for secret operations," an intelligence source said. The restaurants also serve as points for agents dispatched abroad to liaise with headquarters in Pyongyang. Stories of electronic surveillance of visiting South Korean businessmen are a sign that North Korean intelligence regards the eateries as valuable collection points for economic espionage against its main rival. Additionally, U.S. intelligence agencies view the restaurants as one of the few places in the world where North Koreans gather in significant numbers. The restaurants are locations where intelligence officers can ply their trade and recruit North Koreans who eventually return to the closed communist society as spies for the West. North Korea is considered an intelligence "hard target" that is one of the most regimented societies in the world, with extensive political police and security services whose main function is to protect the ruling regime. 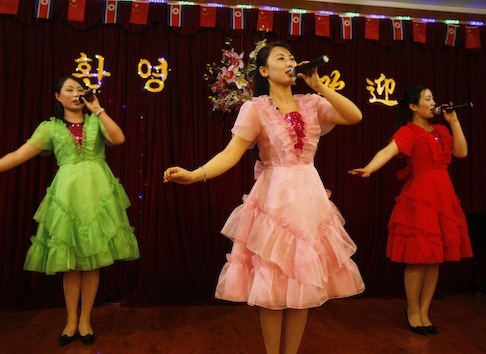 Defectors from North Korea say the living conditions for the overseas workers are inhumane. Most are sent to live in cramped, run-down buildings without heating or cooling systems. Many workers in the Russian Far East are forced to live in underground evacuation shelters or old Soviet-era apartments. Food supplies are poor and medical treatment is limited. Some workers have described themselves as "imprisoned slaves" because much of their earnings are taken by corrupt security officials who oversee their activities. Suzanne Scholte, a North Korea expert who heads the Defense Forum Foundation, said estimates of the amount raised by Pyongyang through its overseas activities run as high as $100 million – mainly from laborers and restaurants that provide funds to the state. "These North Korean workers receive little to no pay for their work as most, and sometimes all, of their pay is sent to Bureau 39 in Pyongyang," Scholte said. "They receive none of the universally accepted protections for workers and are forced to work 12 to 14 hours day with hardly any days off. Most are forced to come up with ways to support themselves since most of their pay is taken. And they have no freedoms as they are constantly monitored by North Korean security department officials and intentionally isolated from the local population." Scholte said the regime is expanding the workers as a way to earn cash. She has appealed to Congress to hold hearings on the North Korean workers. U.S. officials and North Korean defectors with inside knowledge of the regime say the restaurant network also provides professional cover activities for North Korean intelligence personnel. Currently, it is estimated that 30,000 to 40,000 overseas North Korean workers are operating in some 40 countries. Scholte recently asked the Congressional Commission on Security and Cooperation in Europe to conduct hearings on the exploitation of North Korean workers abroad. In Russia, North Koreans have been dubbed "Siberian slaves" for the work they do in lumber camps in the Russian Far East. "We know that the workers that North Korea sends abroad are mostly laborers, but they are also exploiting restaurant employees in China, Cambodia, Thailand, and many other countries; medical professionals including doctors and nurses in Mexico, Nigeria, and Ethiopia, and IT workers in China and Cambodia," Scholte said. Recent defectors from North Korea have exposed the harsh conditions faced by North Koreans, including mass imprisonment in labor camps where up to 120,000 political prisoners are held and summary executions for minor offenses such as communicating with foreigners or smuggling goods from China. Public executions are common and the population has been hit by frequent famines. A report by the Seoul-based Korea Institute for National Unification, based on testimonies of hundreds of defectors, revealed systematic rights abuses. According to the report, North Korea’s totalitarian system is characterized by summary executions, mass imprisonment of political prisoners, violations of rights to due process, freedom of religion, education, travel, and other freedoms. Scholte of the Defense Forum Foundation said Kim Jong-Un recently ordered the government to "send many workers overseas despite the possibility of one or two cases of defection." To help fund the regime, as many as 10,000 new workers will be sent to China and the Middle East to increase the flow of funds. However, North Korea expert Alexandre Mansourov said North Korean restaurants are less important as sources of foreign cash than their role in sub-rosa intelligence and other operations. "Whatever remittances they make are relatively small and add little to the regime's coffers," he said. "Whatever cash flow they generate pales in comparison with what the transfers from Japan used to be. Now that those are history, the regime and its weapons programs are still fine, despite dire predictions." Mansourov said: "One can't ignore the fact that some of the remaining food outlets often serve as local bases of operations for North Korean operatives of all stripes engaged in all sorts of missions in the countries in question." "The roles and contributions of North Korean labor force in Africa and the Middle East is a much more interesting and understudied question, in my judgment," he said. This entry was posted in National Security and tagged Kim Jong Un, North Korea. Bookmark the permalink.